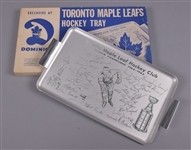 Sold originally through the Canadian chain Dominions, we have a desirable souvenir of the Toronto Maple Leafs' Stanley Cup victory in the spring of 1963. 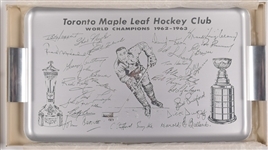 This silver colored serving tray features the image of hockey's ultimate prize along with the Prince of Wales Trophy, with facsimile signatures of the men who brought the Blue and White their second of three consecutive Cup titles, including Tim Horton, Dave Keon and Johnny Bower. 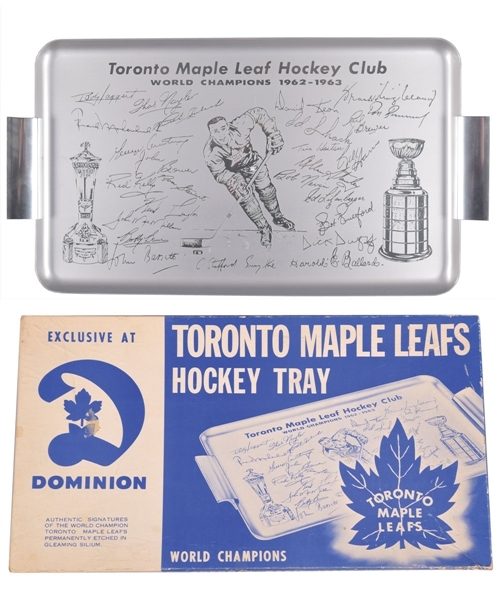 Handled tray measures just over 10" by 17" and remains in gorgeous condition, still wrapped in the original tissue paper, with just a single scratch and a few tiny blemishes. 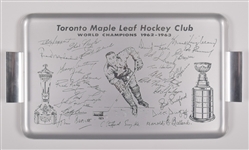 Accompanied by the original box with desirable Leafs graphics, some toning has occurred, with a few creases and surface wear, with a pair of corners split and repaired with clear tape. Always on the radar of advanced Leafs collectors, this is one of the better examples we’ve had the pleasure of handling.